Rogers Wireless and Nokia today announced the Canadian launch and availability of the Nokia E62 business-optimized device, with Rogers MyMail push e-mail solution, enhanced web browsing and Nokia's uncompromised voice quality. Rogers Wireless is the first carrier in North America to offer the Nokia E62 device to their customers. The Nokia E62 device from Rogers Wireless takes push e-mail out of the corner office and into the hands of hard-working business professionals - in cubicles, home offices or small businesses - looking to increase their productivity while on-the-go. The Nokia E62 device provides to corporate employees or independent entrepreneurs alike a versatile push e-mail solution with Rogers MyMail powered by Visto. 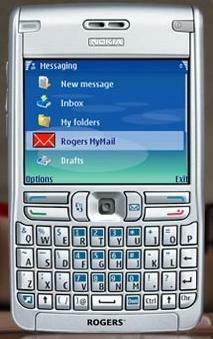 MyMail provides the option to have personal or corporate e-mail to be pushed to the Nokia E62 device. "As Canada's leading wireless carrier operating on the GSM/GPRS technology platform, the world standard for wireless communications technology, we are proud to offer our customers leading edge mobile handsets like the Nokia E62 device," says John Boynton, Senior Vice President and Chief Marketing Officer. "As the first carrier in North America to offer the E62, Rogers business customers will be able to save time by having access to the latest in mobile nnovation and e-mail connectivity." and easy. With the Nokia E62 device, professionals on-the-go can benefit from mobilizing their work e-mail, and businesses of all sizes can mobilize their workforce - easily and affordably. "The E62 device will broaden Rogers Wireless' reach into the enterprise market," said Paul Chapple, General Manager, Nokia Canada. "The competitive price point coupled with push e-mail on a stylish, thin form factor will make the E62 handset particularly appealing to small and medium size businesses as well as enable Rogers to deepen penetration in existing corporate accounts. Nokia is delighted to have the opportunity to launch this product exclusively with Rogers and to assist them in servicing this key market segment." For global business travelers or busy jetsetters, staying connected by voice or e-mail is made convenient with Nokia E62 device's EDGE network capability and quad-band (GSM 850/900/1800/1900) frequencies. Voice features include up to six hours of talk time and 14 days of standby time, superior speakers, five-way conference calling, all on a device that keeps you connected virtually anywhere in the world. All important information and appointments are at one's fingertips by synchronizing contacts and calendar locally with Nokia PC Suite, or over-the-air with Rogers MyMail solution. Road warriors can access entertainment away from the office with the E62 device's built-in MP3 player, video player and gallery, plus game applications. Songs can be stored on the E62 device with 90 MBs of on-device memory. Also, mini SD cards can be purchased to store up to two GB of music that can be side-loaded for listening on-the-go. Browse through images or play video clips while waiting for an appointment or play games like the Golf Pro 2 application included in the E62 device if waiting for a delayed flight to leave. The Nokia E62 device sells for $249.99 after mail-in-rebate with a 3-year service agreement from Rogers Wireless and is available for purchase across Canada through Rogers Wireless dealers, and retail points of sale or online at www.rogers.com. I can't wait to buy this to assist me in my day to day real estate business! Curiouser and curiouser, why would someone get this phone from Rogers when it's around the same price as an unlocked (WiFi equipped) E61? Why haven't Nokia got any E62 phone pages? There is a page up on Nokia's Canadian site.